Narcissists rarely tell the truth, but they are really good at lying and changing history so that their lies sound like truth. They use bits of reality, they transpose people and facts, and they come out with a story that sounds incredibly believable to anyone who hears it. 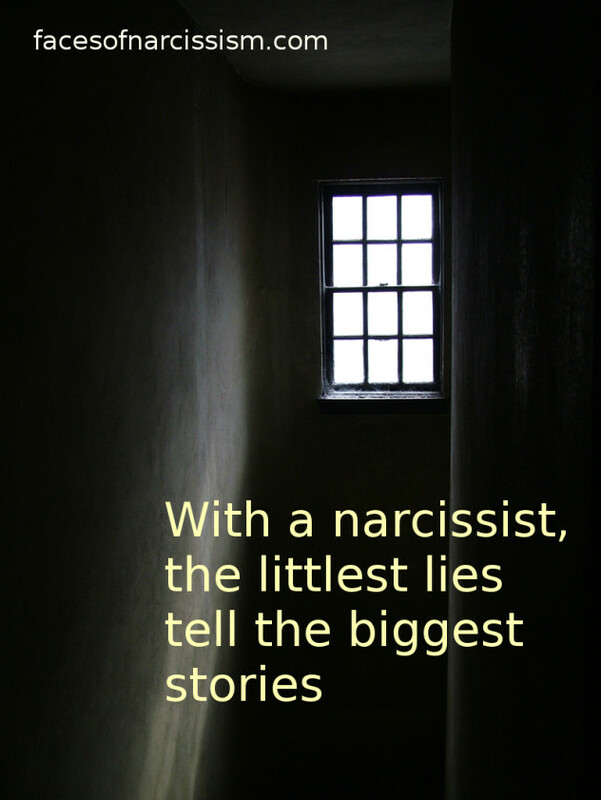 When you get frustrated and try to tell people the truth, they are more likely to believe that calm narcissist who lies so easily and beautifully. Those of us who are loving parents know that when our kids are sick or have a problem, we are right on top of it. Right? My mom wasn’t. I had a couple food allergies and she never remembered. Gee, if soy would put my child in the hospital, you can bet I’d remember! Anyway, my mom moved on not knowing or caring what was going on with me. Just a few years ago, I was searching for some of my papers in her house, and found the medical images from the exploratory surgery the doctor did to figure out what was wrong. I grabbed them in case I ever needed them for some reason. When I got home, I found a note from my mother taped to the back. Oh I was so mad I was shaking. She left that lying and manipulative note that someone could have found, and I wouldn’t have known. I couldn’t have defended myself with the truth. (As usual.) Yes, the doctor said the surgery would be dangerous. BUT, the real reason I was mad was not because we decided to skip the surgery, but because if she hadn’t ignored me for TEN years, there wouldn’t have been any permanent damage! And yet, she had stuck that sob story on the back of the photo like I was some kind of monster who was mad at her when she was innocent. She’s been manipulating stories my whole life, and taught my family to hate me. I’ve had relatives call me yelling or send me hate messages based on what she has told them. Sometimes, I have no clue what she told them, but I can be sure it was a twisted version of the truth! And that’s part of why narcissists are so successful. When they use bits of reality, they seem very believable. Everyone knew I had some health problems. Everyone knew I got very thin. Although she ignored my complaints for years, she later told everyone that she had done everything she could. When she first decided to pay attention, she did take me to a lot of doctors, so she would hold that up as an example of how much she had done. (Yeah right, years and years later!) My mom’s stories probably made sense to people. Especially when they all know I’m that supposedly troubled black sheep who refuses to talk to my poor, dear old mother. Sometimes it upsets me to think of all the lies that have been told about me, but I have to let it go. Only the truth matters.